Speaking of wildlife in New York City, Jamaica Bay is an amazing place to study. It’s an estuary surrounding by Brooklyn, Queens, and a little bit of Nassau County. It is one of the largest tidal wetlands in the United States. Jamaica Bay is a fascinating ecosystem, full of biodiversity, which is having a variety of plant and animal species. In addition to salt marsh, grasslands, coastal woodlands, maritime shrublands and brackish and freshwater wetlands, Jamaica Bay is home to mammals, reptiles, insects, 91 different species of fish and 325 species of birds! All of that information came from the Jamaica Bay Education Resource Directory, online at http://www.nyc.gov/html/dep/pdf/jamaica_bay/jamaica_bay_ed_resource_directory_final.pdf. This comprehensive guide will give the curious teacher lots of thoughts of what to do next. Read the entire guide, or you can consider these suggestions. 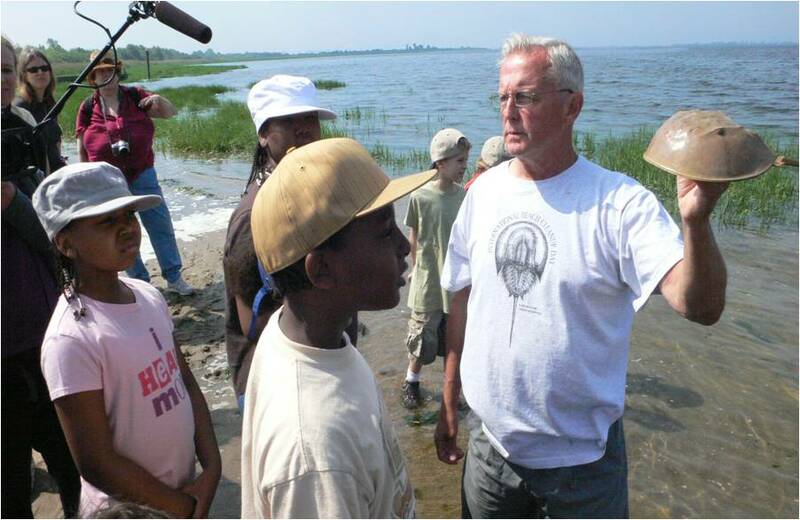 Students learn about horseshoe crabs on a field trip to Jamaica Bay. Here, you have lots of options. Two of the most interesting are guided field trips focused on exploring the natural landscape of Jamaica Bay. You can either go to Marine Park in Brooklyn, which is run by the NYC Department of Parks and Recreation. 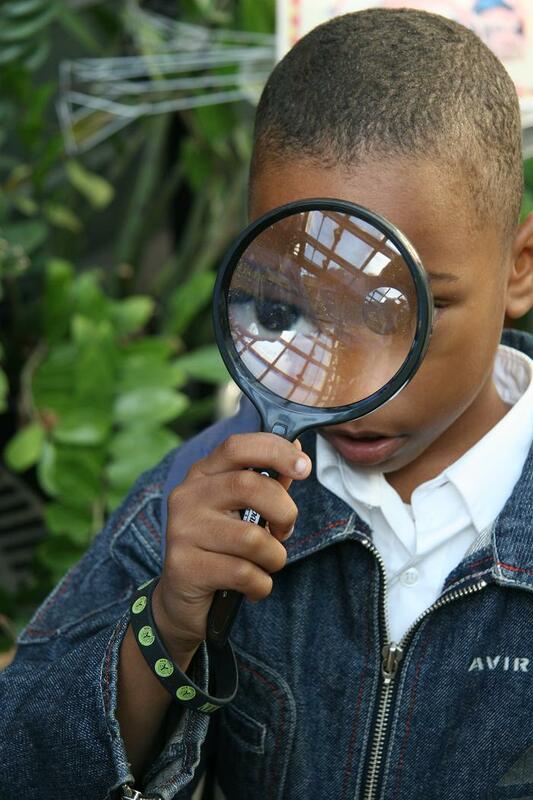 Call 212-NEW-YORK to speak to an Urban Park Ranger and arrange a visit with your class. Or, you can attend the Gateway National Recreation Area, which is run by the National Park Service. Gateway also comprises parks in Staten Island and New Jersey. For information on field trips, check out their website: http://www.nps.gov/gate/forteachers/planafieldtrip.htm. Whether self-guided or ranger guided, teachers must attend a professional development session first, enabling them to best link Jamaica Bay to their classroom. More field trip ideas can be found in the resource directory. Check out Horseshoe Crabs and Shorebirds: The Story of a Food Web by Victoria Crenson. It is set in the Delaware Bay, but the food web and ecosystem described also applies to Jamaica Bay. For a great, rhyming introduction to salt marshes, check out A Day in the Salt Marsh by Kevin Kurtz. The book will get students ready to think about all the different life forms in a salt marsh, and there are lots of teacher ideas at the end. There are many more excellent books listed in the resource directory above. Don’t forget that we have an indoor beach at the museum, perfect for cold, winter days. There’s a dock tank, a sand play area, an investigation of horseshoe crabs, shells to examine, and a touch tank. 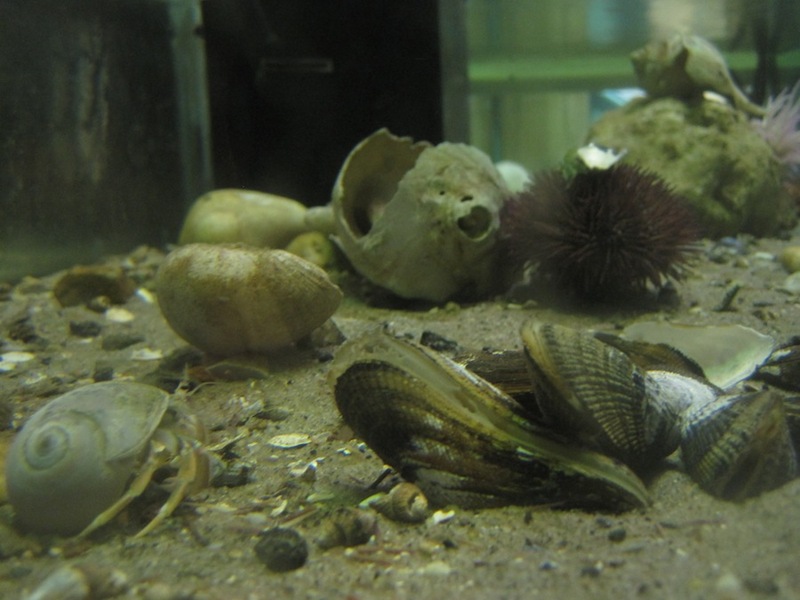 Most of the creatures in our touch tank come right from Jamaica Bay. We usually have local horseshoe crab, hermit crabs, mud snails, mussels, and clams as well as sea stars, brittle stars, sea urchins, sea cucumbers, larger snails and sea anemones from farther away. Inside the touch tank at the Brooklyn Children's Museum. The hermit crab and mussels were collected in Jamaica Bay. Note that the mussel in the foreground has its shell open! Nature? In New York City? Sure! New York may be a concrete jungle, but it’s also home to forests, ponds, rivers, beaches, estuaries, bays, the ocean, and all the animals and plants that go along with those natural formations. Don’t believe us? A great resource for learning more is Wild New York: A Guide to the Wildlife, Wild Places and Natural Phenomena of New York City by Margaret Mittelbach. This book will make you look at New York City is a whole new light. It’s a great pre-reading book for the teacher looking to incorporate more local nature into his or her classroom. Students will enjoy Go Wild in New York City by Brad Matsen. The reading level is closer to 5th grade, but it is an excellently photographed book with images of urban wildlife in New York. Place the plant in a deep bowl of water. The water should cover the plant. Place the glass jar over the plant, trapping it. The glass jar should be completely full of water. To do so, lower the glass jar on its side into the bowl, letting all the trapped air bubbles escape, and then tip it to cover the plant. Leave the plant in a sunny place and watch what happens. You will notice that bubbles will rise from the plant and eventually there will be a pocket of oxygen that gathers at the top of the jar where there used to be water. Explain to students that, just like all trees and plants, the hornwort’s leaves takes the sun’s light and carbon dioxide and turns it into food for the plant. At the end of this process, the plant produces oxygen, which is what human beings breathe in. You cannot see the oxygen leaving all plants because oxygen just mixes into the air, but since this plant is underwater, you can see the process called photosynthesis at work! The full concept of photosynthesis won’t be taught until high school, but even young learners can understand that plants breathe out oxygen with this great activity. 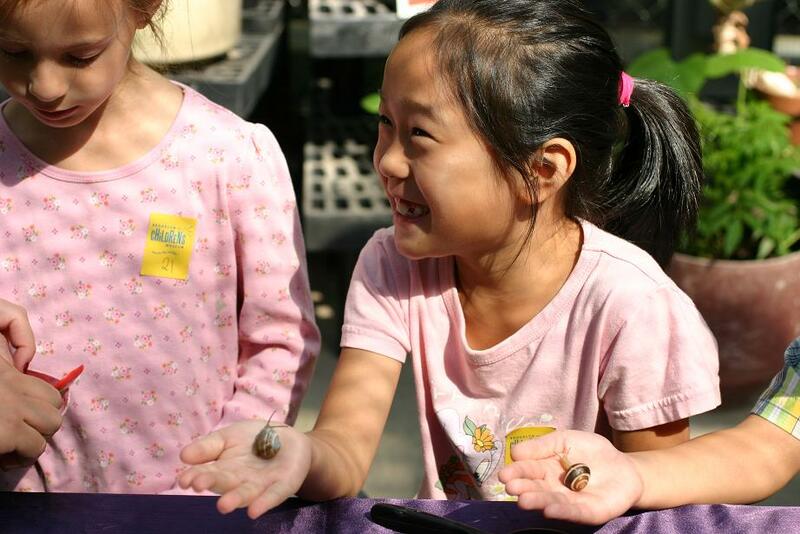 When planning to incorporate nature in your classroom, where to start? This may seem obvious, but the key is letting children start by exploring. All learners, but early learners in particular, need to be given the opportunity to observe for themselves and formulate their own questions before being told what to do. Young students are still learning how the world works and need time to watch and think. 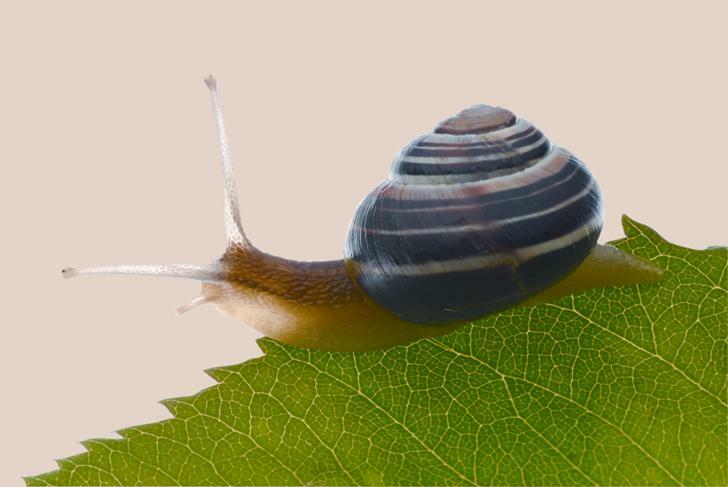 Snails are an animal that kids can handle safely. They are plentiful (especially after the rain), will walk on a student's hand, and are reasonably durable, as long as students are taught not to squish them. Before leaving the classroom, make sure that students know not to touch any animals they find. For plants, explain that if a part of the plant is attached to the ground or to a tree, it should be left alone. Leaves or seeds on the ground can be picked up. Give each student a clipboard and piece of paper. Pre-literate students can draw what they see; literate students can both draw and write their observations. If students are having trouble focusing, give them a prompt to focus on. Ask students to observe the ground for five minutes, then the air, then look for signs of animals, then plants, etc. What do you see? How does it move? Asking students to observe, describe, write, and draw will help unleash their natural curiosity and help you decide what to teach next! Students should have some time to sit and draw or write, as well as some time to walk around and explore. Give students boundaries, but allow them to move freely within those boundaries. If one student finds something particularly interesting (a spider web, a puddle, a live animal), you may want to re-gather the class so they all have the chance to see it. When you return to the classroom, have students share what they saw and any questions they may have. Some questions may be answered during the course of your regular curriculum, while others may merit extra research by the class. Take note of which topics they were interested in; these could provide ideas for what to focus on next. We keep using this phrase “my green community.” By now you may be wondering, what is a green community? A green community is one that takes care of the environment. A green community provides a healthy environment for plants and animals, including people. This definition may be sufficient for a teacher of very young students. Alternately, you may be interested in a more comprehensive look at what elements make a community truly green. 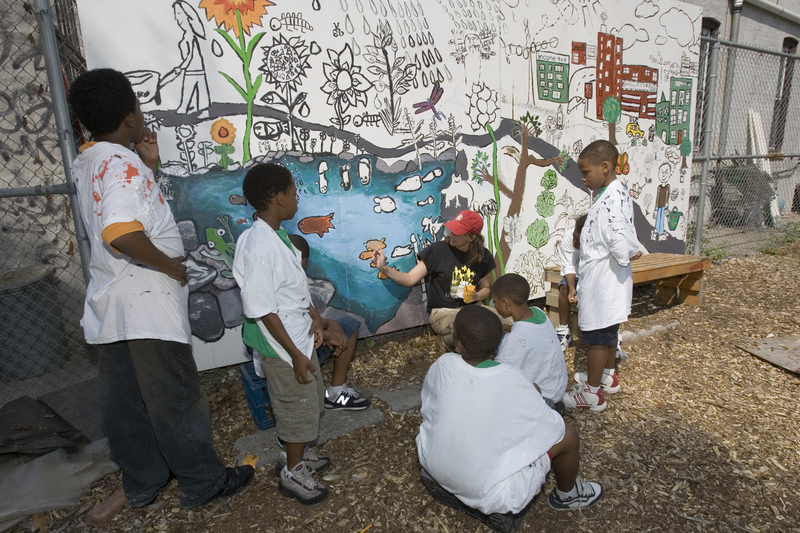 For adults, one great starting point is an exhibition produced by the National Building Museum in 2008 entitled Green Community. Their website (http://www.nbm.org/exhibitions-collections/exhibitions/green-community/green-community.html) has extensive information about what a green community is and is not. This includes five categories of green and information about real places that fit into these categories. While this is a great resource, it is designed for adults. We at the Brooklyn Children’s Museum have spent time thinking about how to take these complicated ideas and present them appropriately to children. Our city is growing! Every year, Brooklyn is home to more people. More people need more houses, more food, more everything. What do we do if we run out of space? 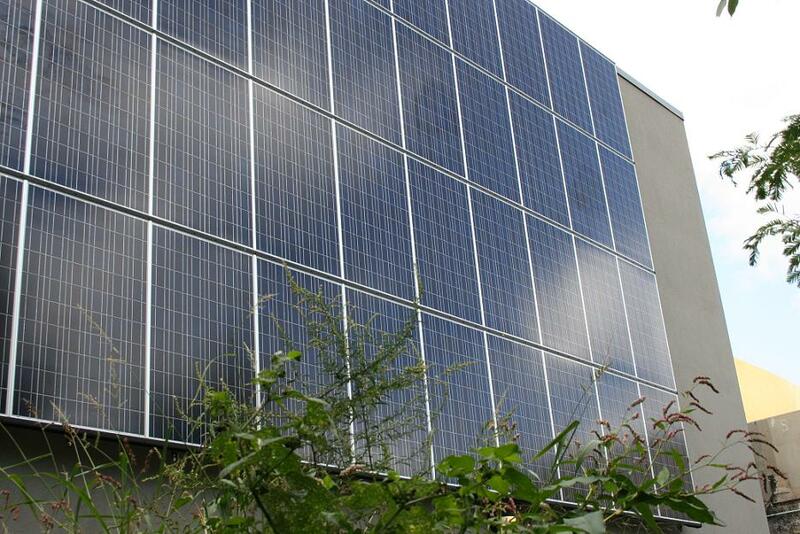 In a green community, people think creatively about how to use space. Example: The MTA uses a lot of power to run the subways and buses. To reduce some of their power demands, they installed solar panels on the roof of the Stillwell Avenue Terminal in Coney Island. The canopy of the station went from being wasted space, to renewable energy for the public transit system. What’s the best mode of transit? You! Whether walking or biking, physical activity is good for your health and good for the planet. If you have to travel a long distance, take the bus or subway. Brooklynites are already some of the greenest people in the United States due to their massive use of public transit! Think of good ways to use less. Turn the lights off. Don’t leave the water running. Re-use a water bottle. Think about how to use less – less water, less plastic, less energy, less of everything! Take care of the plants and parks around you. Plants are important – they provide oxygen, keep temperatures cool in the summer, provide food and shelter for animals, and look beautiful, too! Seeing nature’s green around you is a sign that you can breathe easy. To help identify instances of these five actions, the Brooklyn Children’s Museum has developed a family guide to Brooklyn that looks for evidence of green places and practices in the borough. The print guide and an accompanying online map will be available soon. What would you include in our map of Brooklyn?